Someone who stumbled across my CZ-82 posts wrote me to tell me about his project. He broke down, stripped, blued and reassembled his CZ-82. The final product looks great and he graciously granted me permission to post the picture and the process he used. As usual…click to make bigger. Looks really nice doesn’t it? 2: He got the grips from grips4u.net and reports a perfect fit out of the box with no fitting. 1. Stripped paint with Jasco paint stripper/remover from Lowes/Home Depot. Don’t forget to remove your grips and move them well away from your work area. This process may take a few applications. I used a brass and nylon brush to remove the loose paint and get inside of internal parts of the gun. 2. Once stripped, I saturated it with degreaser (BC Gun Scrubber), just to make sure all paint and oil was removed. 3. Of course this process removes ALL paint, so don’t be shocked when your white dot sights go away (this can be taken care of easily later). 4. I used 600 grit, cloth backed, wet/dry sand paper to begin the polishing process. Use long strokes to go with the grain of the metal. I left the top of the slide alone as not to polish off the matte. I then move to 00 steel wool, and then to 0000 steel wool. Clean and degrease when done (steel wool has some oil in it that needs to be removed before bluing). 5. I used Oxpho Blue, 100% cotton cotton balls, Q-Tips, 0000 steel wool, and some chop sticks (for dipping cotton balls into the bluing), and a blow dryer for heat. Don’t forget to glove up for everything after the initial stripping of paint. Oxpho Blue supposedly doesn’t have a problem with oil from fingers, but I wasn’t willing to risk it. 6. Heat the metal and use long even strokes with an Oxpho Blue covered cotton ball and/or swab. It will dry quickly on the heated metal and begin to oxidize / rust. Give it a minute to sit (60 – 120 seconds) and then burnish well with your 0000 steel wool. To really get a good blue you need to spend the time to burnish well. This process evens out the blotchiness of the bluing process and preps the metal for the next application. 7. I repeated this process 6 times before I was happy with the color match and sheen of the cold blue (heat, blue, burnish). 8. I then took the parts and put them in boiling water for about 3 minutes. I then applied a slurry of baking soda to all newly blued parts, then after about 30 minutes, I dunk the blued parts back into the boiled water to remove the slurry. This process neutralizes the acids in the bluing process and begins to help eliminate the smell. 9. I then use a light gun oil, like Rem Oil or a little CLP and some 0000 steel wool and shine op all the blue. This is really the final burnish for your bluing. 10. (This one is an extra step, but a recommended one) Now to completely remove the smell I put the blued parts in a gallon ziplock bag filled with motor oil for 48 – 72 hours. 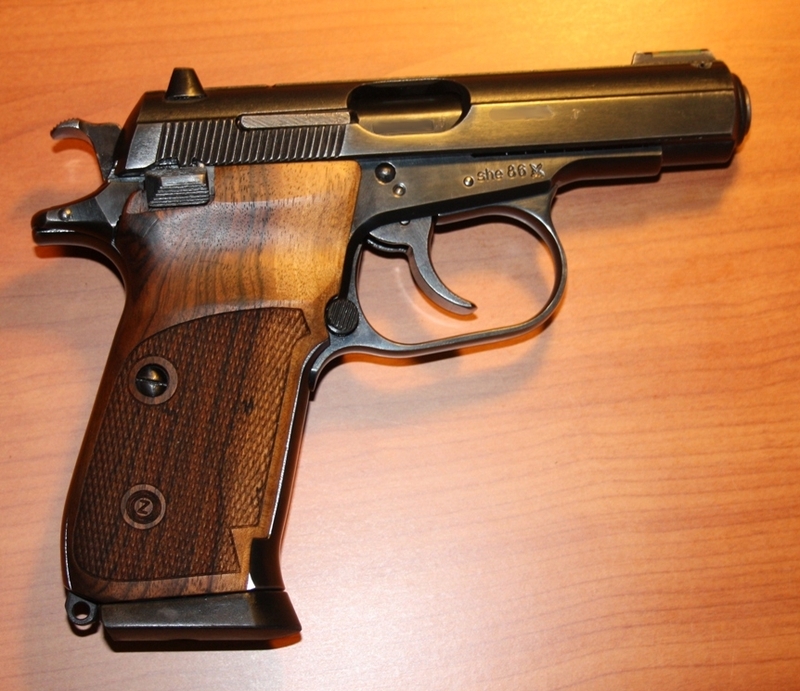 The generous gunney who was the originator of the procedure above gave permission to post a picture of his own CZ-82 that he refinished using this procedure. Again, click to make bigger. 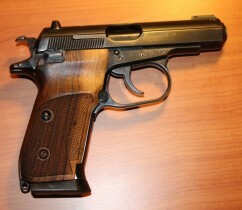 This one has original grips which the owner obviously did some polishing on as well. Very nice job on both the metal work and the grips. These little guns really clean up nice…and they shoot great too. 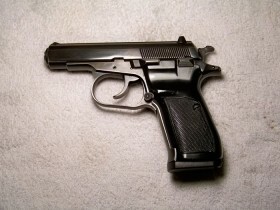 This entry was posted in CZ-82 (vz. 82), Gunsmithing by Sailorcurt. Bookmark the permalink. I recently refinished mine with an anodized bronze finish which looks amazing, I also added a squared off 83 trigger guard because the old one broke, happy to send a picture if desired. waiting on grips as of now. How far was the gun broken down? just enough to expose all exterior surfaces, or complete disassembly? It was a while ago, so I don’t remember all the details, but I’m pretty sure it was broken all the way down. I think they used my disassembly and reassembly instructions which is why they sent the pictures to me in the first place. Here’s the last reassembly post of that series. It includes links to all of the other posts of the disassembly/reassembly series. Thanks Sailorcurt for all the disassembly and reassembly instructions of the CZ-82. I just found these and as a new owner of a CZ-82 these guides where very very helpful. Say, could one just stop after the paint strip, degrease, and polish, then use a penetrating CLP combined with heating up the parts first? I just want to do the slide, no internals and not the frame. Sure you could, but I’d be a little worried about it rusting up eventually. you’ll have to keep it oiled and don’t leave it stored for a long time if you’re not going to replace the protective coating. I’d say you’re better off refinishing it with something rather than just leaving it plain steel, but whatever floats your boat. What base plate do you have on your mags? I’ve got a mix of the flat ones and the thicker ones. I prefer the thicker ones because the flat ones tend to dig into my side when carrying IWB, but the thicker ones don’t always work on mags that started out with the flat baseplate so you have to be careful about that. When they don’t work, the mag doesn’t lock securely into the magwell and you end up with feeding problems. Since I’ve got a few spares, I typically use the flat baseplate mags as range mags and the thick baseplate mags for carry.